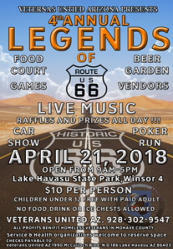 April 21 2018 Legends of RT 66 at Lake Havasu State Park. Windsor Park. open 9 am till 5 pm . set up Friday April 20 starting at noon till dusk. BBQ for vendors Friday night at 4 pm. Vendor space available $100 1 day only. No outside food or drink no ice chests. bring your own chair for concerts. $20 For Car Show includes shirt. Pre sold tickets only. $10 at the gate no t-shirt with entry. Custom Car and Bike/Bicycle show. 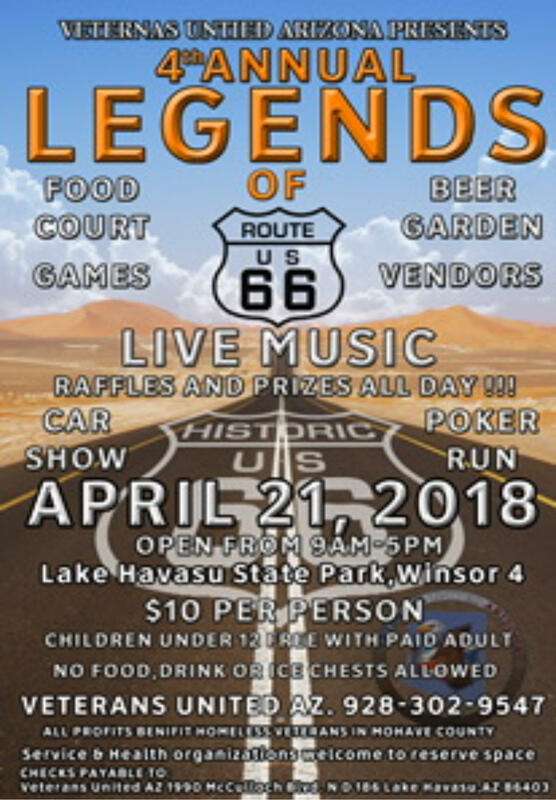 All ages, poker run on 21st, all wheel Run. Beer , food, and more. Live music. Looking for Volunteers to help out at this event, very rewarding to help with support of Veterans.